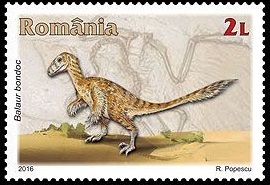 70 million years ago, on the territory that is today Tara Hategului. 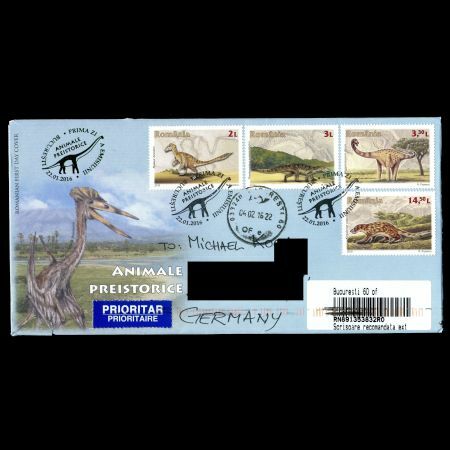 It was part of a tropical island in the Tethys Ocean, the ocean separating Eurasia from Gondwana, following the fragmentation of the single continent, Pangaea. 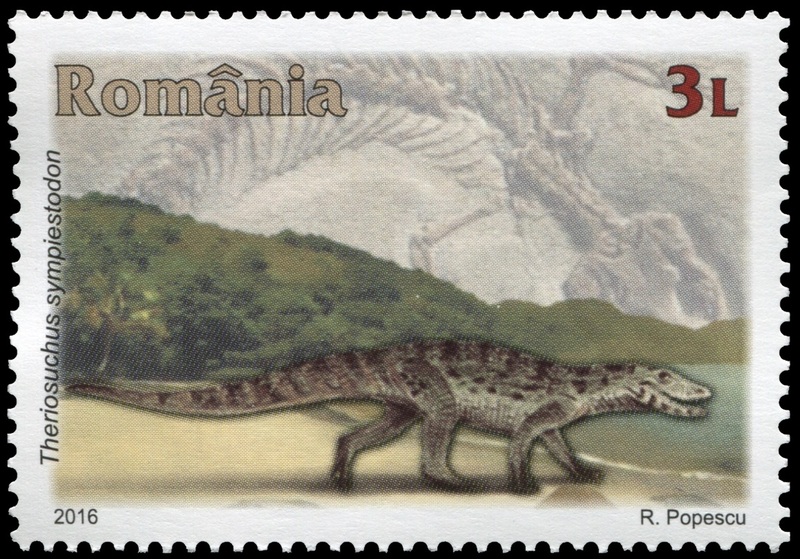 The island was populated by an exotic association of prehistoric animals, whose remains are today preserved in the rocks of the Tara Hategului. 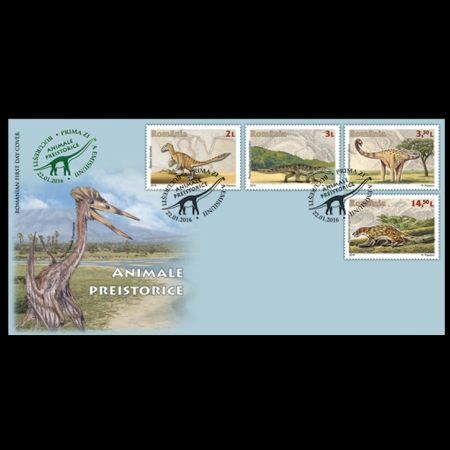 Here were discovered numerous sites with bones of crocodiles, turtles, mammals, flying reptiles, birds and a large number of fossils of dwarf dinosaurs, herbivores and carnivores, unique in the world, together with nests of dinosaur eggs. 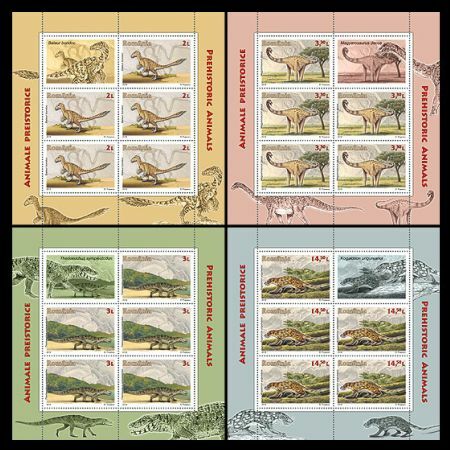 Lack of permanent links of the island with the mainland areas determined, in time, the adaptation of the dinosaurs's size to a small space and smaller quantities of food. 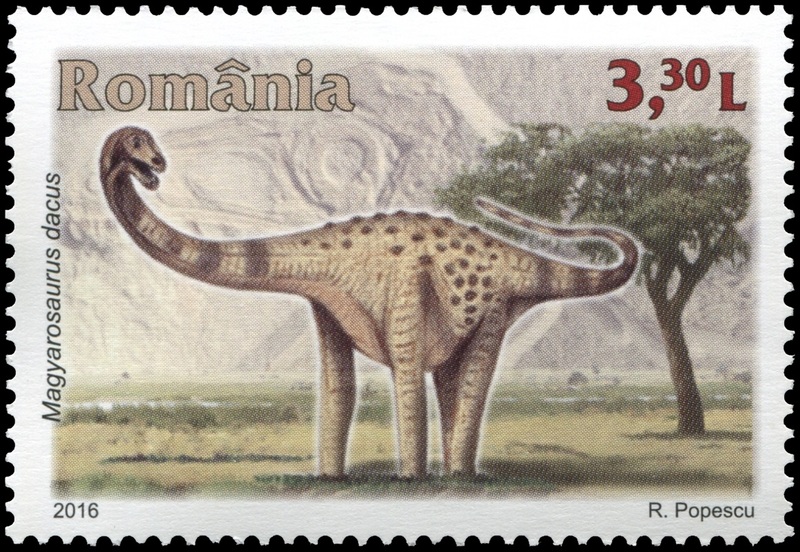 The dinosaurs that lived here were smaller than those on the mainland, being known in the scientific world as the dwarf dinosaurs of Transylvania. This phenomenon has been termed as insular dwarfism and could also be observed in other types of animals. 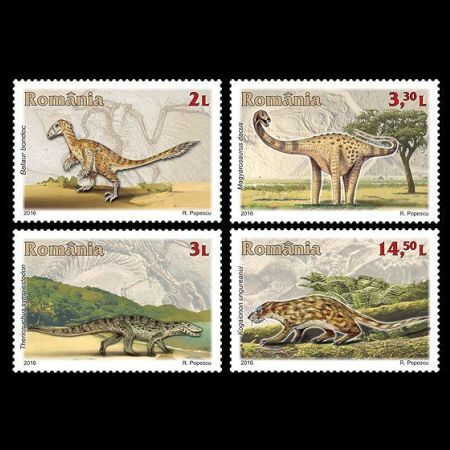 Dinosaurs Geopark - Tara Hategului is an area of research, education and sustainable development, committed to preserving the geological, natural and cultural heritage, and strengthening the identity of local communities. 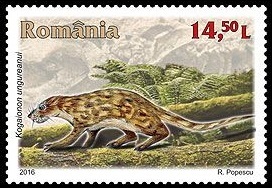 It is a natural park and a UNESCO Global Geopark, managed by the University of Bucharest, and member of the European Geoparks Network and the Global Geoparks Network supported by UNESCO. 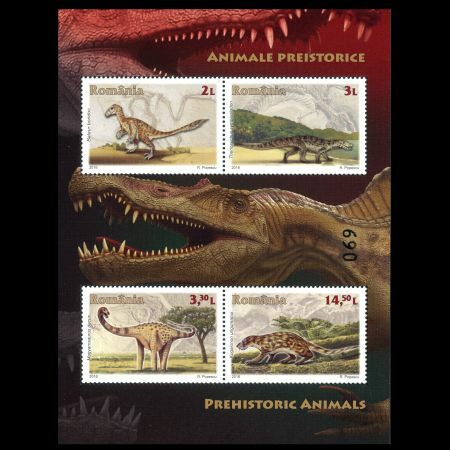 The postage stamp issue presents prehistoric animals whose fossils were discovered in Tara Hategului and which are important elements in building a Museum of Transylvanian Dinosaurs and the Geopark's development. 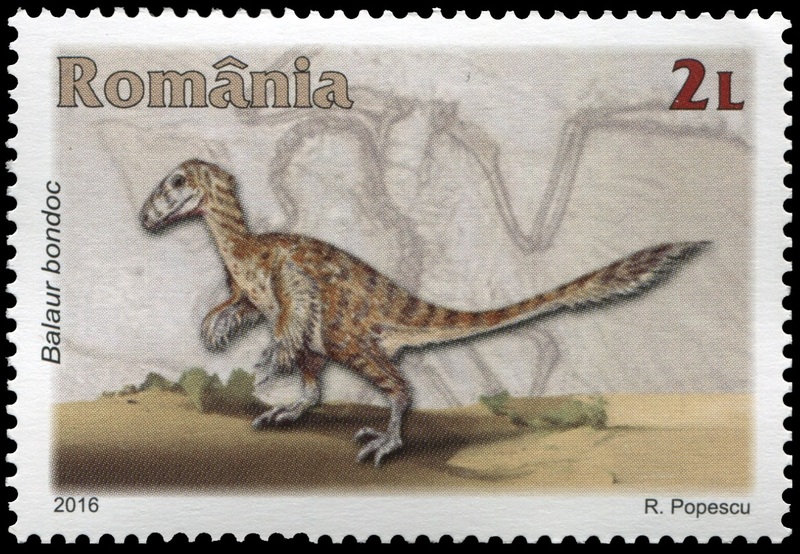 Balaur Bondoc, illustrated on the postage stamp with the face value of lei 2.00, was a predator dinosaur, having a body length of 1.80 - 2 m, covered with feathers. 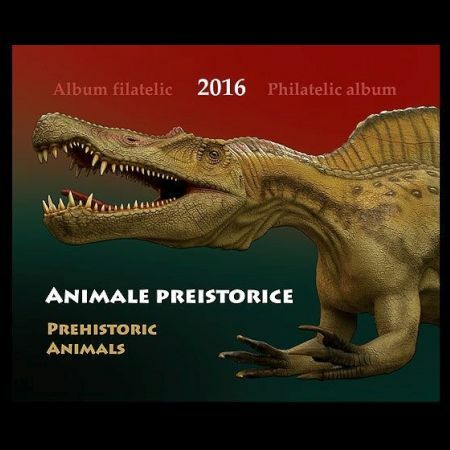 This predator had a powerful torso and very solid hind limbs with two sickle claws, while the forelimbs were more elongated and equipped with only two functional fingers. 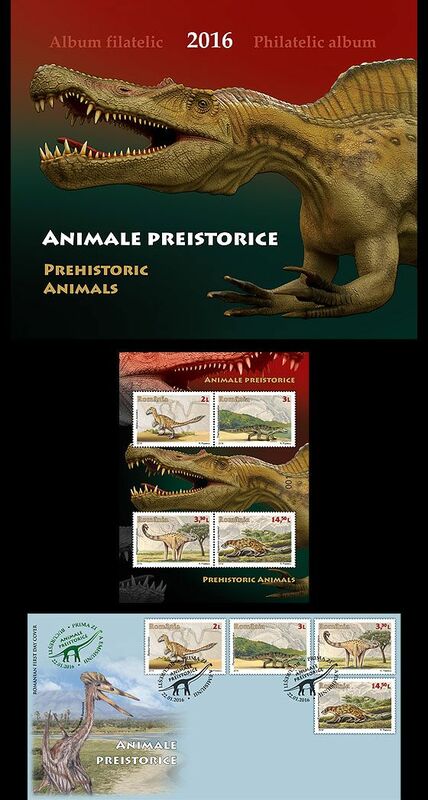 Theriosuchus sympiestodon was a primitive crocodile that lived in Hateg about 70 million years ago. 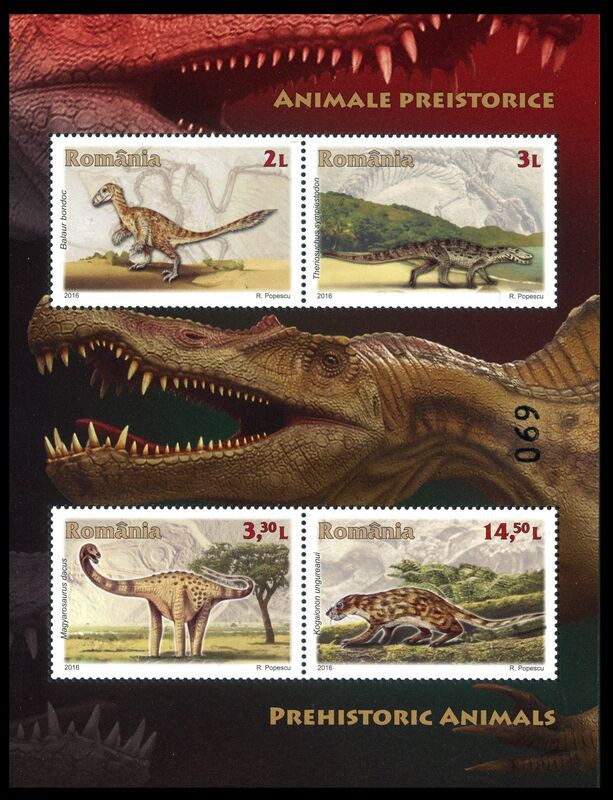 Theriosuchus was a real "living fossil" - it was part of a family whose members had already disappeared in other parts of Europe millions of years earlier. 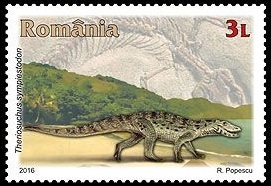 This one is illustrated on the postage stamp with the face value of lei 3.00. 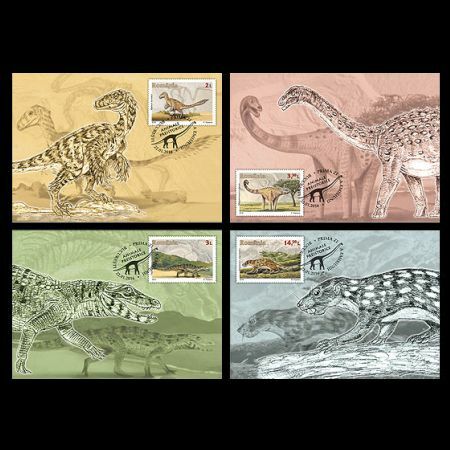 Magyarosaurus dacus, illustrated on the postage stamp with the face value of lei 3.30, was a herbivorous dinosaur with a length of 7 m and a height of 3 - 4 m, one of the largest prehistoric animals from the Hateg area. It weighed 800 - 900 kg. 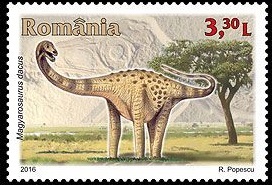 It walked on four legs, having a very long neck and tail. Kogaionon ungureanui is illustrated on the postage stamp with the face value of lei 14.50. 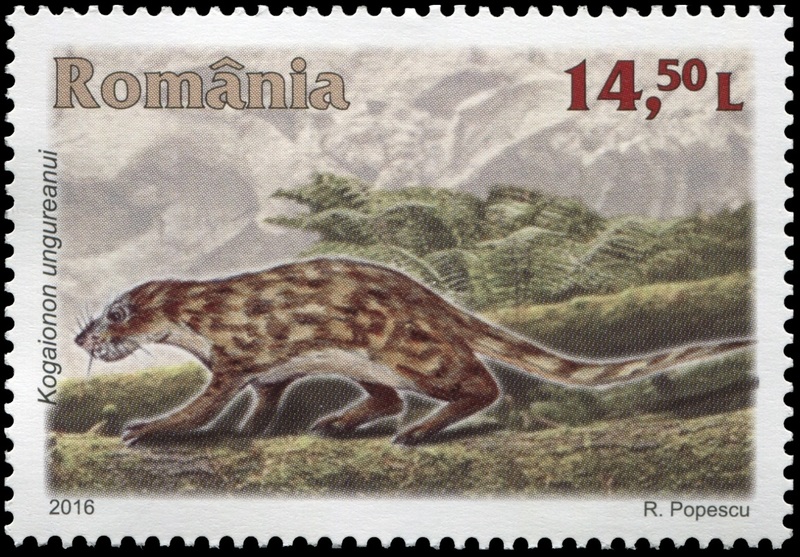 It was a small mammal, described and known only in Tara Hategului. 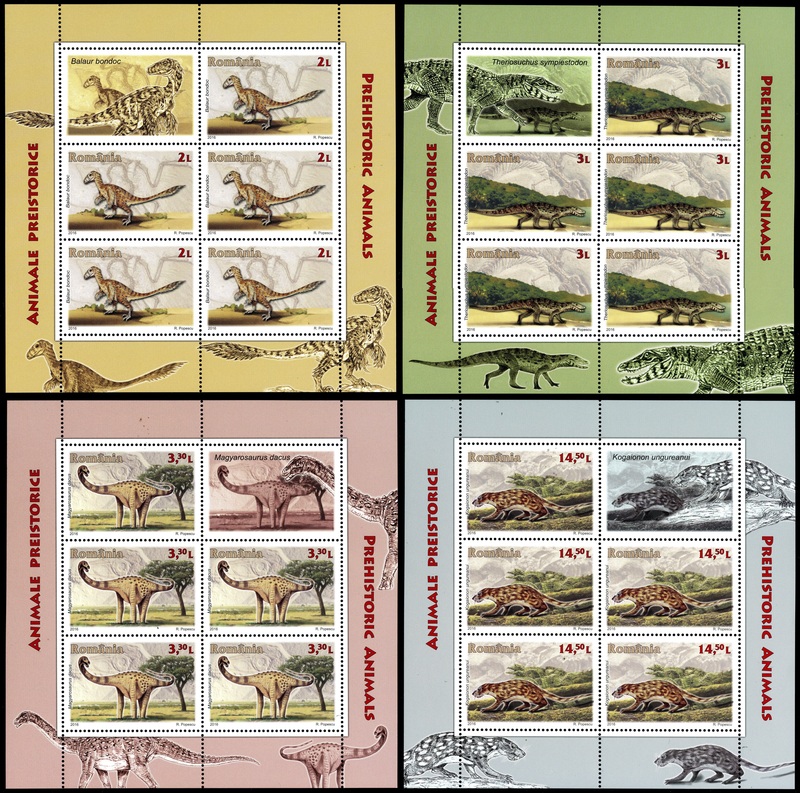 From it, a complete skull was kept, which is extremely rare in mammals during the late Cretaceous.